Elected to the Thirty-fifth Parliament for South Metropolitan Region from 7 February 2000 in succession to the retirement of Hon. Stanley (John) Halden. Elected to the Thirty-sixth Parliament for North Metropolitan Region on 10 February 2001. Re-elected 2005 (for term commencing 22 May 2005). Resigned 11 August 2008. Parliamentary Secretary to the Minister for Planning and Infrastrucure: 20 March 2001 - 27 June 2003. Parliamentary Secretary to the Minister for Education: 20 March 2001 - 13 January 2003. Parliamentary Secretary to the Minister for Sport and Recreation; Indigenous Affairs: 20 March 2001 - 27 June 2003. Parliamentary Secretary to the Minister for Education and Training: 14 January 2003 - 26 April 2005. Deputy Chairman of Committees: 31 March 2005 - 21 May 2005. Reappointed 24 May 2005 - 11 August 2008. 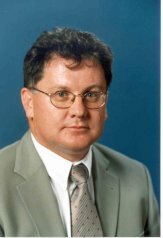 Shadow Minister for Works and Services to 10 February 2001. Member, Ecologically Sustainable Development Committee: 21 March 2000 - 21 May 20011. Member, Joint Standing Committee on the Anti-Corruption Commission: 27 June 2001 - 13 May 2004. Member, Joint Standing Committee on the Corruption and Crime Commission: 13 May 2004 - 21 May 20011. Member, Standing Committee on Procedure and Privileges: 31 March 2005 - 21 May 20052. Reappointed 24 May 2005 - 11 August 2008. Member, Standing Committee on Public Administration and Finance: 26 May 2005 - 17 August 2005. Member, Select Committee on the Finance Broking Industry in Western Australia: 21 June 2000 - 7 December 2000. Member, Select Committee into the Department of Education and Training: 15 November 2006 - 11 August 2008. Born 21 February 1959, Camberwell, Victoria. Arrived in Western Australia on 19 November 1981. BA (Politics/Philosophy/Sociology). Masters (Industrial Relations). North Metropolitan Region includes the Legislative Assembly electorates of Balcatta, Carine, Churchlands, Cottesloe, Girrawheen, Hillarys, Joondalup, Kingsley, Maylands, Mindarie, Nedlands, Perth, Wanneroo and Yokine. Enrolment (30 June 2005) 391,214; area 996 sq km.